Who knew that a self-proclaimed geek would forever change the way that we live our lives? The passing of Steve Jobs makes me a bit incredulous at my own sadness. I would have never dreamed that a technological genius would have such an impact upon me. Yet his brilliance has brought technology to my fingertips in a way that I would have never imagined. Thank you, Mr. Jobs, for all you have done in your time on this earth. 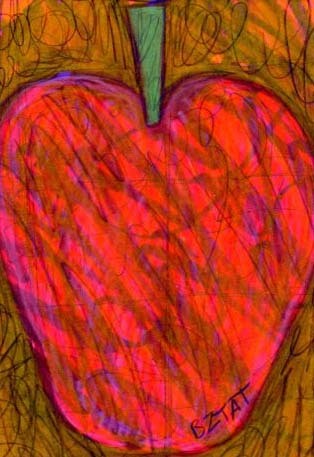 My drawing today is my tribute – an apple that represents the simple elegance of style upon which you insisted. Highest bid at 10:00 pm EST on Friday 10/7/11 wins the piece. Okey's October: What? A Westie?